ClassicLEDs LLC is please to offer another in their expanding line of Camaro LEDs. This set is for the 1982 Thru 1992 Camaro. This system contains two large LED boards only. Each board contains 196 super bright 5mm red LEDs filling the lens with 4 times the light of an OEM bulb. Each PC board is white giving an improved appearance over an LED bulb containing less LEDs. The arrangement of LEDs expands the light and appearance. 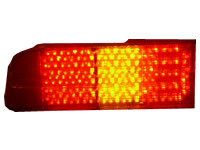 When the brake is applied, the normal brake light area LEDs fill the entire lens with light. In addition, the clear reverse lens fills with red LEDs almost doubling the red area. 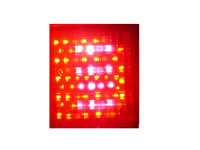 The reverse light area contains 16 white LEDs. 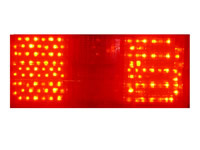 When the reverse light is used, four lines of four LEDs light. When the brakes are applied, this area also lights up red. Boards installs using our 1156/7 bulb base wire harness. These install in the same manner as the OEM bulb. Boards are held in place using a clear silicon adhesive (not included). signal and turn signal and Reverse light bulbs. This can be done using a Dremel tool or other cutting tools. Detail instructions with photos are available. Please download instructions for additional information. A sequential system is also available and will be offered soon. Please email for additional information. All ClassicLEDs systems are manufactured in Oregon and come with a limited lifetime warranty to the original owner. ClassicLEDs LLC is a small family owned business. Only the upper section sequences. Both the upper and lower operate during brake and running light operation. However, when the turn signal is used, the upper section sequences. You may rotate the boards and have the sequence on the bottom if you like. The center yellow section will show as red. The clear reverse section will contain red LEDs. This section is not completely filled with red as in addition to the red LEDs, there are white LEDs when the reverse lights are used. This show section one of the turn on the PC Board. The clear lens has glare.